14 / 28ct. Antique White (stitched 2 over 2) from Wichelt Imports. Stitch count is 133 w x 133 h.
7 shades of one color range were used in this design. Any 4 solid colors may be used (with blending) to achieve the shading. 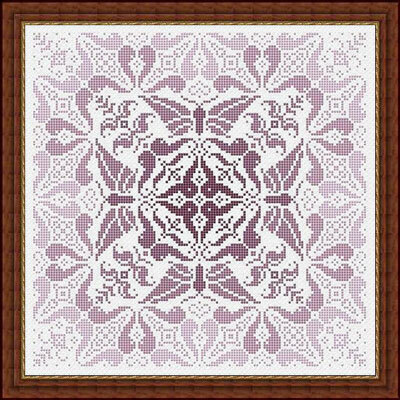 Any variegated or solid color thread may be used to stitch this design, you can reverse or eliminate the shading. The chart includes 7 different color palettes in popular color ranges to choose from or create your own.